The study is subdivided into three main stages: market analysis, use cases, and possibilities and solutions. After working on the first two sections, the consortium partners will be presented with intermediate results to assess and discuss further investigations. 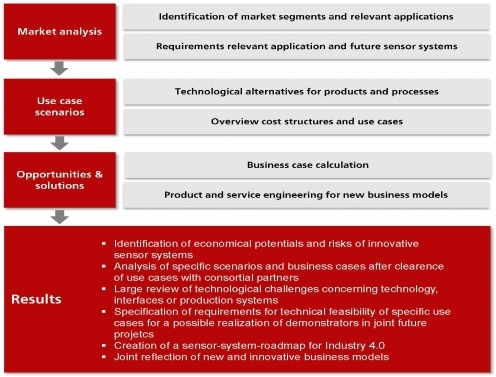 At the beginning of the study, promising market segments will be analyzed and relevant applications of innovative sensor systems identified. The following deduction of their technological requirements can lay the foundation for the later realization of the selected use cases. Afterwards, technological product- and process alternatives will be compared and the resulting cost structures determined. For a better assessment of the potential chances and risks different value-added scenarios and business models will be provided to the consortium. The overall results contain already specifications for implementation of functional prototypes in subsequent projects. Furthermore participants gain the opportunity to get in touch with leading research institutes, industrial unions and industrial corporations within the network.